Literary citizenship isn’t just about engaging people who already love to read or write and talk about books, but also about expanding the literary world. 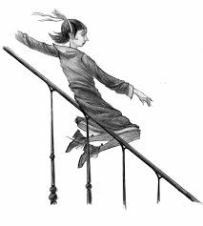 Books can change lives and influence attitudes for good or ill.
Read the rest of his excellent round-up post here. 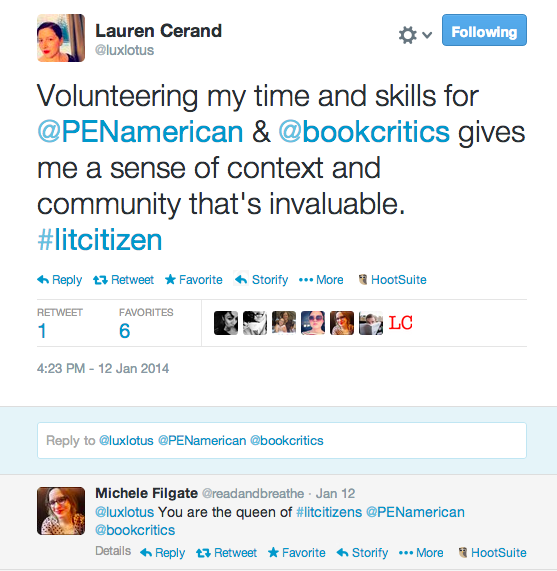 Let’s practice some genuine literary citizenship, people. Let’s do something positive. AWP is this close to having a quorum. They are at 54%. They need to get to 60%. 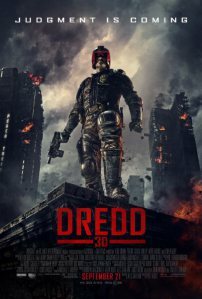 By next week! Incentive for them: If they get to 60%, they save beaucoup bucks in legal fees, and they’re better equipped to serve you. Incentive for you: You can win a Kindle Fire or Paperwhite. Plus, you know, making a difference and all that. Just go here and vote. Even if you voted last year–the last time I tried to help in this effort–you have to vote again! How should you vote? Vote yes or no. Doesn’t matter. Just vote. Who should vote? Every freaking body. Tenure-track faculty. Non-tenure track. Individual members. What are you voting for? Here’s the explanation from my friend and colleague, Jill Christman, member of the AWP board. We are closer than we have *ever* been to reaching the quorum necessary to reform AWP’s governance and enter this millennium with pens poised. AWP’s current articles of incorporation and bylaws have many vestigial remnants from the 1960s and 1970s, when AWP was a much smaller organization. We need new bylaws and articles to help AWP to better serve a more diverse and bigger association. Regional representation of the programs and faculty will continue in the new system of governance, with the regions expanding from five to six groups of membership. Each of the new Region Councils shall have a representative on the board, as the regions have now. The last call for votes brought us up a couple percentage points, but we’re not to 60% yet, and we need to get there before the end of this semester. You don’t have to vote “yes.” You don’t even have to vote “no.” You simply have to register your presence. Let us know you were there. Remember, the voting cycle started anew in Fall 2013, so if you voted *before* that, do it again now. Remember the final pages of Horton Hears a Who​? The mayor tearing up those fabulous Seussian staircases in Whoville with his megaphone in search of that single shirker? That final, critical, town-saving “Yopp”? Go find the Jo-Jos in your program and encourage them to put down their yo-yos and vote. We can do this. Tweet “I voted in the AWP election. I’m a #litcitizen” and I’ll see it. Share this link on Facebook and rouse YOUR friends into a voting frenzy. Another way to think about Literary Citizenship: do we have an obligation to raise and address social issues in what we write? Does what we read reveal our societal concerns? For example, one of my favorite dystopian novels is The Handmaid’s Tale by Margaret Atwood, which I realize speaks to my anxieties about women’s equality. Read this post by Eric Long and share with us your favorite dystopian novels and WHY you like them. Be a Lit Citizen: Donate books, drink beer, and be merry! What better way to practice literary citizenship: donate books and drink beer. Haley Muench tells you how. Indiana will soon have twelve more breweries to boast of in 2014. The Indy Star recently did a quick survey of some of the new businesses which you can glance at here. But one of these breweries (number 2 on the list) has an interesting twist that caught my attention. 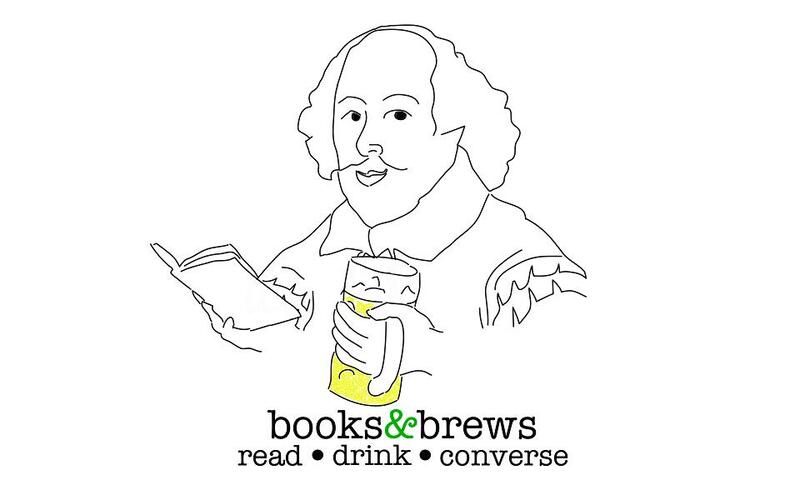 Books and Brews can be found at their website, on Facebook, or on Twitter. Books and Brews, located near 96th and Hauge Rd Indianapolis, began as an idea for a bookstore and then added on the brewery as a way to attract more customers. They will feature live music, readings, beer tasting, a mug club, and more! The shop hopes to open this month (February 2014) and has done a fantastic job of keeping anxious would-be patrons updated with their progress. Every week in my Literary Citizenship class, I’m giving my students a new weekly “experiment” or intention. Social media doesn’t have a reputation as a force for good. A lot of people think that it makes us self-absorbed, etc. And this is true, don’t you think? It’s hard not to use SM to celebritize ourselves, to share our oh so amazing thoughts, to brag on ourselves oh so humbly. Social media does cause us to turn inward. So let’s try something different for a week: lets use it to focus outward instead. For the next week, use social media ONLY to help others. 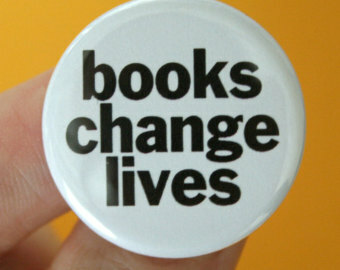 For one week, you are trying to make the world a better place for books. Share links. Praise others. Thank others. Talk about books you’re reading, your favorite writers or magazines. Nothing about yourself unless it helps someone or something. Outward focus only. Nothing inward. 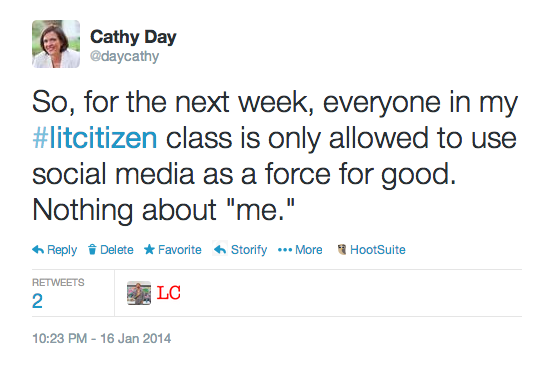 Every time you engage in this activity, use the hashtag #litcitizen. 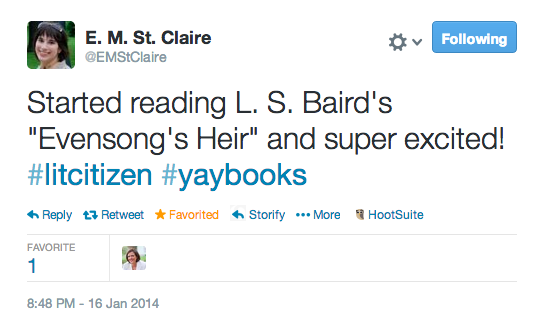 Actually, that’s exactly what FridayReads is: Literary Citizenship. 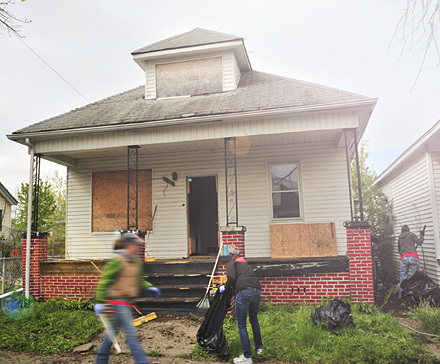 Our mission is simple: to enliven the literary arts of Detroit by renovating homes and giving them to authors, journalists, poets, aka writers. It’s like a writer-in-residence program, only in this case we’re actually giving the writer the residence, forever. 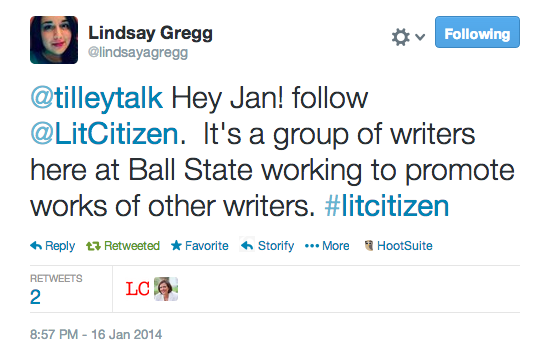 And here’s the best part, how you get to keep the house: be a literary citizen. contribute content to the WAH blog on a regular basis. use the home as their primary residence. In general, they will be responsible home owners, engaged neighbors, committed city residents and good literary citizens. Apply for a residency and spread the word.